This year, Haven Today celebrates 80 years since its founder, a radio personality, first found Christ and started a program seeking to give its listeners the only rest there is: eternal rest for the here, now, and hereafter. Many of you remember listening to Paul Myers, or the three following speakers of Haven: Paul Evans, Ray Ortlund, and now, Charles Morris. Here we have Peggy Campbell, president of Ambassador, recalling her lifelong story with Haven. I still remember the day Jon and I met Charles and Janet Morris. At the time, Charles was being invited to consider joining Haven Today—it’s hard to believe that’s been well over a decade ago! I have heard my parents recount the story of Haven’s remarkable founding many times—a once well-known radio personality whose life ended up in shambles, coming to Christ in a hotel room with a Gideon’s Bible. A homeless alcoholic, Paul Myers was transformed spiritually—and just a month after his salvation, the Haven of Rest with First Mate Bob was launched. It was my own privilege to know the two speakers who preceded Charles—our beloved hosts Ray Ortlund and Paul Evans. Their ability to bring inspiration each day, woven between musical selections, made Haven one of the staples of Christian radio. The music of the Haven Quartet filled our home as it did the airwaves for more than seven decades. The artistry of the Quartet and a variety of remarkably talented musicians—men such as Paul Sandberg, Truitt Ford, Steve Ragsdale and others—brought encouragement more times than I could say. Even the Haven building for many years was memorable—I recall meeting with the ministry in its iconic ship-shaped (literally) building in Los Angeles (sold long ago) … and, of course, the classic ship’s-bell opening that was part of the program for many, many years. When you arrive at 80 years of history, it seems most appropriate to do some reflecting. 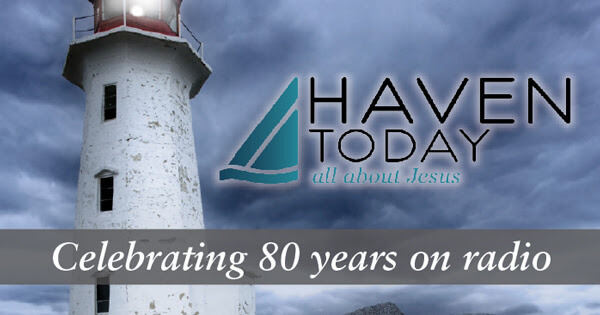 And that’s exactly what you’ll be hearing on Haven this week as Charles looks back at God’s grace over eight decades. At the same time, let me just say that there’s no time like the present either. I’m so glad that Haven hasn’t depended on the past to empower its future. Led by Charles Morris, this ministry that is all about Jesus is continuing to provide vibrant, timely, biblical content every day. Haven Today is just that! So enjoy reflecting on God’s providence. And then let’s give thanks together that as great as the past has been … we’re looking to a future impact in even greater dimensions! Want to learn more about Haven’s history? Check out an early film we found of First Mate Bob and the Haven Quartet. And then listen to song clips of the Haven Quartet’s best-selling album: A Cappella. My name is Shana Holt and I work at Crown College in Knoxville, TN. We have a radio broadcast and we are trying to find the Haven of Rest with Rayu Ortlund. (prior to the year 2000) We would like to broadcast it on our daily program. Who could I speak with in regards to getting recordings of those broadcasts or being able to do that? Thank you in advance for your help. Have a blessed day! Hi Shana. Thanks for your interest in Ray Ortlund’s old broadcasts. I’ll email you directly with more information.